In America, a watering hole is the place you go where everybody knows your name. In Hong Kong, it’s either a cha chaan teng or a noodle house. But finding somewhere close to home or work where the dishes are consistently reliable is a challenge in a city where ever spiraling rents are forcing many traditional eateries in the CBD to fold. 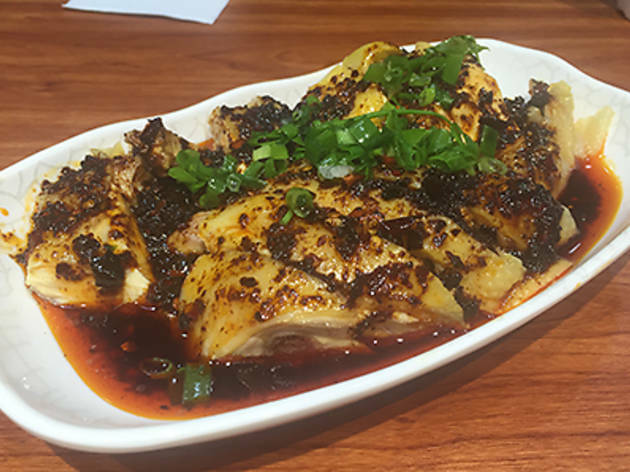 Fortunately, Sichuan restaurant Chuan Ting is taking on the challenge alongside other budget eateries, such as dumpling houses and kebab shops, on Wan Chai Road. An all-day menu and the no-frills interior of white fluorescent lights and bare tables tells us this place is about the food – and nothing else. We don’t dilly dally and begin with dan dan noodles ($18) and the signature spicy chicken ($25). 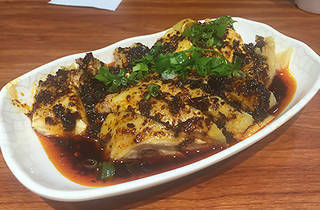 The fowl arrives and it’s covered with a red Sichuan chilli sauce. It carries a spicy kick, but the flavour of the peppercorns and toasted chilli keeps stimulating our appetite. Despite our rapidly numbing tongues, we polish it off in a flash. We’re told the noodles are made specially for the restaurant and tailored to a thinner consistency. Served without any peanut or sesame sauce, we know that they’re done true to Mainland style. It’s a little disappointing the noodles lack any signature bite, but the thin texture of each strand is better for soaking up the soup. The staff are polite and friendly here, and sometimes you just want somewhere dependable for a decent quick meal. Chuan Ting is definitely good for that.